Last night Pastor Irek took us along to watch his City’s women’s volley ball team…really high standard match! Well, we did our best to ‘make some noise’ and support the local team! 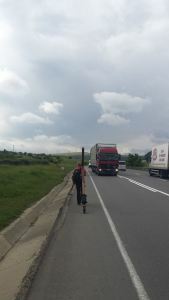 Apparently having us there made it easier for Irek to witness to his friends for Jesus….. glad we could be of service!!! Alan shared two stories, both from Poland of people coming to Christ that really encouraged the church. At the end of my preach I gave an opportunity for those who felt they were still outside Gods Kingdom to enter and at least four people indicated that they wanted to do that. And after the meeting I got to the refreshments after Alan, eventually I arrived only to find him once again sat at a table surrounded with women!!! After the service were taken out for lunch and this evening one of Irek’s flock, a GP, invited us to her house for an amazing dinner! We would like to give a massive thank you to Pastor Irek who has absolutely spoilt us this weekend! I hope we have been an encouragement to you brother.